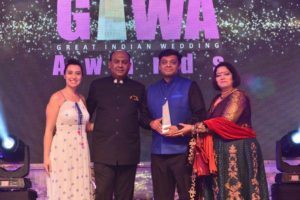 The Great Indian Wedding Awards (GIWA) in 2014 & 2015. Nothing makes one feel as good as an appreciation from an International Organization, for a work well done. We are indeed fortunate to win a Silver at this year’s Great Indian Wedding Awards (GIWA 2015-16) for the Best Mehndi Ceremony conferred by the International Convention for Wedding Fraternity (ICWF). ICWF is an organization dedicated to recognize and uplift the quality of Wedding Experiences in India. The GIWA awards is an honour presented to those agencies pushing the boundaries of creativity and excellence in crafting extraordinary wedding experiences. We believe this award is a testament to the unending Trust bestowed upon us, all the timely support extended to us by our Clients, patrons and associated partners and along with the dedication and hard work put forth by our Team as a Family in the thick and thin of execution. Our sincere thanks to all from the bottom of our hearts for taking us to even greater heights! 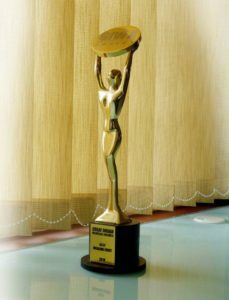 Ergo Consulting has been awarded the Golden prize for the Best Mehendi Event, for the Great Indian Wedding Awards ’14, conducted by International Convention of Wedding Fraternity being held at Goa.